A seed starting mix with these ingredients is often labeled as “soil-less.” In the truest sense, these ingredients contain no soil or dirt and are considered to be sterile. They are not jam-packed with living organisms. Garden soil, on the other hand, is filled with organic matter and is home to active bacteria and fungi. 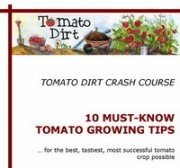 That means if you grow tomato seeds in garden soil, they’re much more susceptible to the dreaded damping-off disease that kills so many seedlings. Sphagnum peat moss, vermiculite, perlite, and coir complement each other well in a seed starting mix. Sphagnum peat absorbs water. Perlite allows adequate drainage, which lets roots have plenty of oxygen. Vermiculite retains moisture so that plants don’t dry out but have access to nutrients. Coir retains moisture, offers good drainage, doesn't compact, and is a renewable resource. Well-balanced, prepared mixes combine these ingredients. 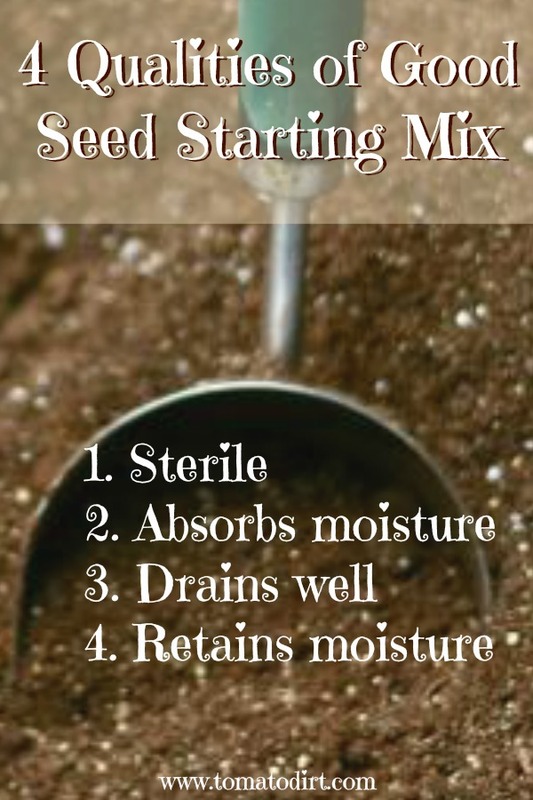 Most sterile commercial seed starting mixes are peat-based with added ingredients for aeration. Peat is partially decomposed organic matter. It has been compressed in low-lying ground where water sits, containing hardly any oxygen. That slows decay, leading to partially-carbonized composites. The resulting material, peat moss, is organic and acidic. Its acidity inhibits bacteria and fungi – a plus for new plants. When dry it forms a water-repellent crust. Specifically, sphagnum peat moss is derived from sphagnum moss and considered to be a high quality peat. It is the most preferred type of peat for horticultural purposes. Sphagnum peat can hold up to 20 times its dry weight in water. Its ability to absorb water helps keep new seedlings moist. But sphagnum peat moss works best for seed starting when combined with other ingredients to retain water (not just absorb it), loosen the mixture, and give roots some breathing room. Perlite, a form of volcanic glass, is a mined material. Its strength is aeration. Perlite allows a seed starting mix or potting mix to have tiny air pockets and keep the mixture drained. This prevents overwatering that can easily lead to drowning for new seedlings and plants grown in containers. Perlite is also very inexpensive. Its biggest drawback is also its strength: it doesn't retain water well, which means it dries out quickly. That’s why it’s most useful when combined with ingredients that hold moisture, like sphagnum peat moss and vermiculite. Use a dust mask when handling dry perlite since it can easily be inhaled. Vermiculite is a naturally-occurring, shiny, flaked mineral that resembles mica. It retains moisture well (about 200% - 300% by weight). It’s also inexpensive. Vermiculite’s water-retentive properties allow it to easily distribute nutrients to plants. The major drawback of vermiculite is that it retains too much water if used solely on its own and can suffocate the roots of plants. It’s most effective if used in combination with other ingredients. Use a dust mask when handling dry vermiculite since it can easily be inhaled. Coco coir is coconut husk residue. Gardeners are excited about coco coir (pronounced “kwaher”) because it drains well and needs less watering than most potting mixes. Another significant advantage to coir is that it is a renewable resource. Coco is a by-product of the coconut-processing industry. As coconuts are grown and harvested, more coco coir is produced. Read more about coco coir and its benefits as a potting mix medium. Most seed starting mixes contain trace nutrients at most. There’s little need for added nutrients at this early stage because a plant’s initial nourishment is already packed inside the seed itself. But once seedlings have two sets of true leaves, it’s time to feed them a bit. You can add a bit of compost when you transplant tomato seedlings to their next size container or include a small amount of water-soluble fertilizer (such as Miracle Gro for tomatoes) in your moistening regimen. If you select a peat-based seed starting mix, check the label. Make sure it contains a little lime to reduce the acidity and create a balanced combination – or add a dash on your own – because sphagnum peat moss is acidic. Sterile potting mix: do you need it for growing tomatoes?